Hey, I sewed chiffon and it wasn’t all that bad! 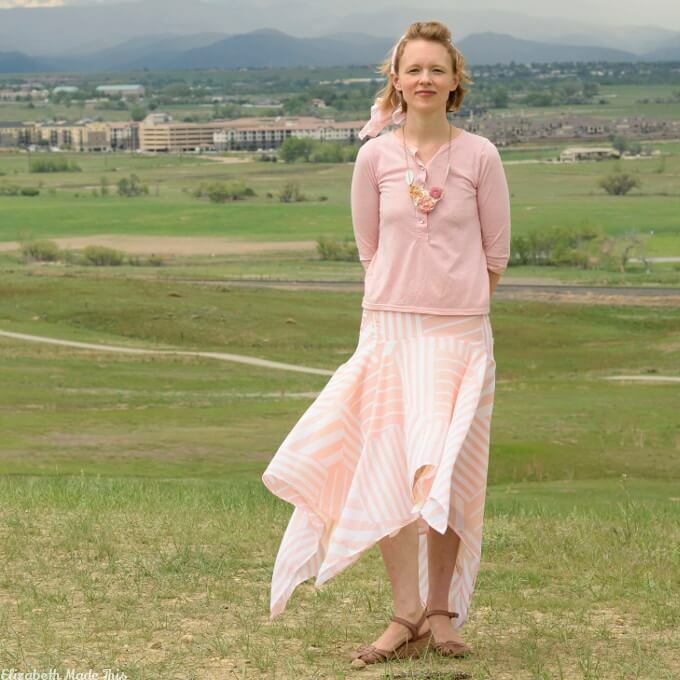 In keeping with my very loose goal of trying to wear more skirts, I added this peach chiffon skirt to my small collection of wearable skirts. The chiffon has been in my stash for a couple of years just waiting for the right project, and this turned out to be just that project. How about you? Have you sewn chiffon? Do you have any favorite tips for handling it? I’ve seen Burda Easy pattern magazines floating around occasionally, but this issue is the first one that I’ve bought. The concept is really pretty cool for a magazine. They take a few basic models and turn them into the many other patterns in each issue with a couple of additions or subtractions from the main pattern. Looking through them is a really good introduction to how designers can take one idea and develop it into an entire collection very quickly. In the case of the skirt patterns from this issue, they start with a pencil skirt (with lots of exposed zips) and then change the silhouette with various squares of fabric inserted into the seams. I chose the frothiest of them all. I periodically go through all of my Burdas when I need some new ideas, and this immediately jumped out at me. The soft drape of the hem would be perfect for chiffon. 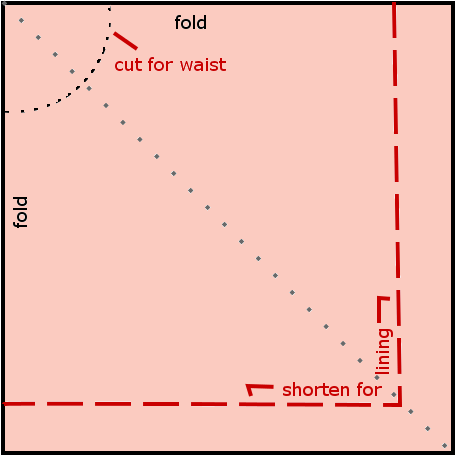 The only problem–sewing chiffon. 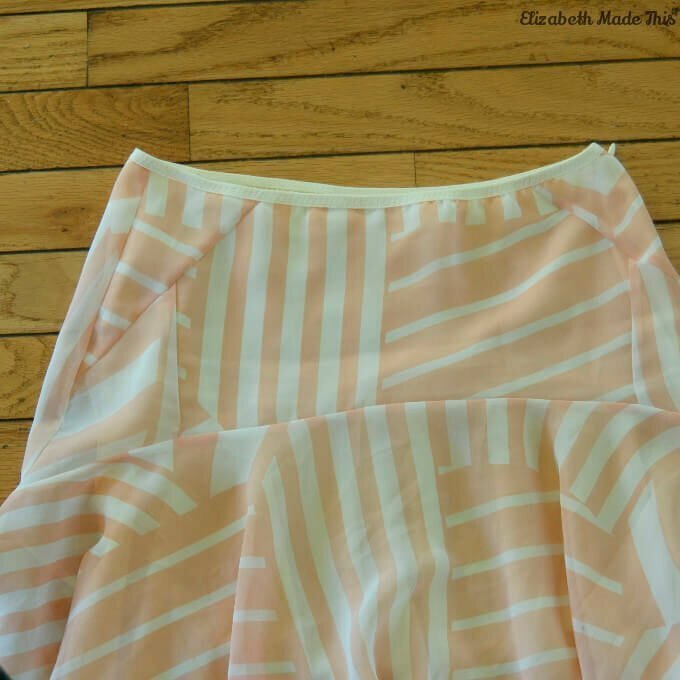 I took Sarah Veblen’s Understanding Sheers class years ago on Patternreview, and I remember her saying that polyester chiffon was the one fabric she would avoid at all costs. She convinced me that it was spun by Satan himself. I could still hear her loud words echoing in my head when I came across this striped polyester chiffon. It was in a group of flat folds at Colorado Fabrics, and I picked it up and put it back down again no less than 3 times, trying to be wise. Still, I ended up buying it because the peach was so pretty and the stripes that go every which way were so interesting. I figured that one day I’d be brave enough to tackle it or it would end up being a wadder. Chiffon is a love/hate fabric. It’s hard not to love the drape and the flow and the soft romanticism of this fabric, yet it’s a bear to handle. So what do you do dear? You starch the living daylights out of it. I’ve been catching up on That Sewing Blab, and Alethia made a passing comment on one episode about starching chiffon to help with the handling. What a great tip that turned out to be. 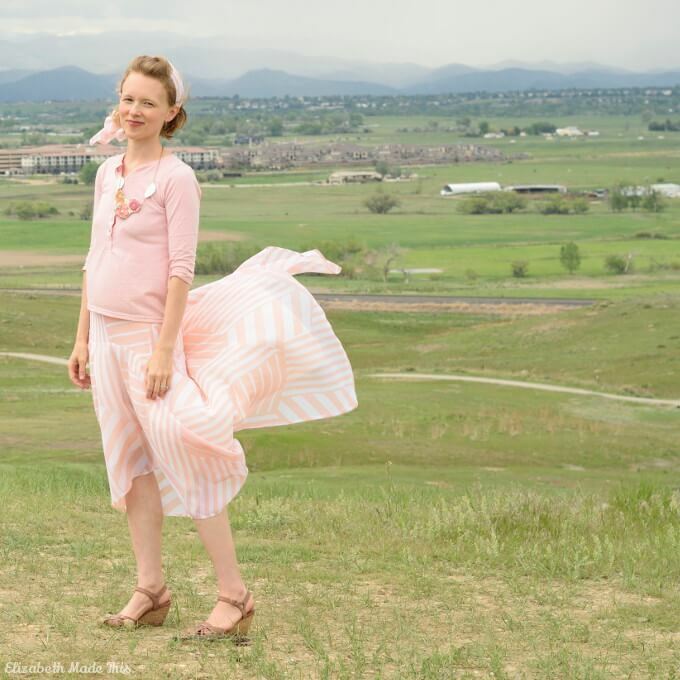 Even with all of the many seams on this skirt, I had no problems handling the chiffon. The starch kept the fabric from shifting around on me while sewing and cutting and made it no more difficult to sew with than a cotton voile. If you’ve never picked up Sandra Betzina’s book More Fabric Savvy, I’d highly recommend it. She lists about every fabric under the sun and then gives you advice for what needles, finishes, stitches, and threads to use. For chiffon, her advice is to use cotton thread for construction because it doesn’t stretch (no puckers in the seams!) with fine microtex (sharp) needles. For hems, she recommends using fusible thread in the bobbin. When you press it, the fusible thread melts to stabilize the fabric and give you a nice crisp hem line which you can then roll. I’d need to show this in a video to explain it properly, but let’s say for now that it works so well. Polyester is such a hateful fabric when it comes to pressing, but the fusible thread pressed into the PERFECT hem. The fusible thread worked so well that I made an extra scarf for my hair with the leftover fabric. To simplify the waistband, I eliminated the waistband facings in the pattern in favor of foldover elastic. 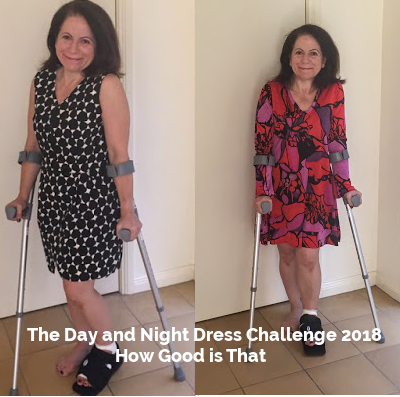 I did the same kind of tiny waistband on my lace overlay skirt on my night dress for The Day and Night Dress Challenge. It’s quickly becoming a favorite way to handle waistbands on skirts because it’s minimal and extremely comfortable to wear. As a bonus, that little bit of elastic helps hold up my skirts which is a real challenge on my body. The pattern as is is unlined, but I added a lining in nylon tricot. I did this because of the sheerness of the chiffon and because I hate wearing slips. I eliminated all the seams on the fronts and the back by overlapping the pattern pieces. Doing this required me adding a dart in the back as the back has kind of a princess line. I shortened the skirt lining by 4″. The tricky thing about the pattern is that the bottom skirt portion is just a big square with a hole in the middle. You get this by folding the fabric twice and cutting the circle on the fold as you would for a circle skirt. Because of this, if you shorten it, you have to shorten both sides of the square. This might be my favorite skirt that I’ve ever made. It just floats. You know that scene in Funny Face when Audrey Hepburn is running down the stairs and her dress is floating behind her? That’s totally how this fabric moves. This will not be the last time I sew chiffon for sure! Your skirt is beautiful and you did a wonderful job with the chiffon. I’m putting spray starch on my “Things to get List” right now! Thank you Faye. The starch really did the trick. Before when I tried to think about what to make with this fabric, I’d give up in frustration because it would just slip straight out of my hand, but with the starch, it cut and sewed up as easy as cotton. I usually just grin and bear it when using chiffon, but the fusible thread and starch ideas sound genius! I definitely need to check further into that! You should totally try it. It made such a difference–especially the starch. A serger rolled hem is a nice option too for a hem. Your chiffon skirt is absolutely beautiful! When I work with slippery fabrics, I use a gelatin mix which functions much the same way as the starch. In case you are curious about the gelatin mix method, you can find it on the Threads website…There was an article by Susan Khalje about it. Thanks for sharing the tip about the hem. Thanks Tomasa. I will definitely check out that Threads article–thank you. I’ve heard other people say that the gelatin method is really good too. How long does it take for everything to dry? Hmmm…I have never timed it. I usually do it and then walk away to run errands and such. But these slippery fabrics are usually lightweight so I imagine not very long at all. By the way, the Susan Khalje article about the gelatin was entitled “Firming Up Fabrics with Gelatin” posted on 10/23/2012 (to help you find it faster). Oh thank you! I’ll look it up (I might have it actually…)! This is such a gorgeous skirt. 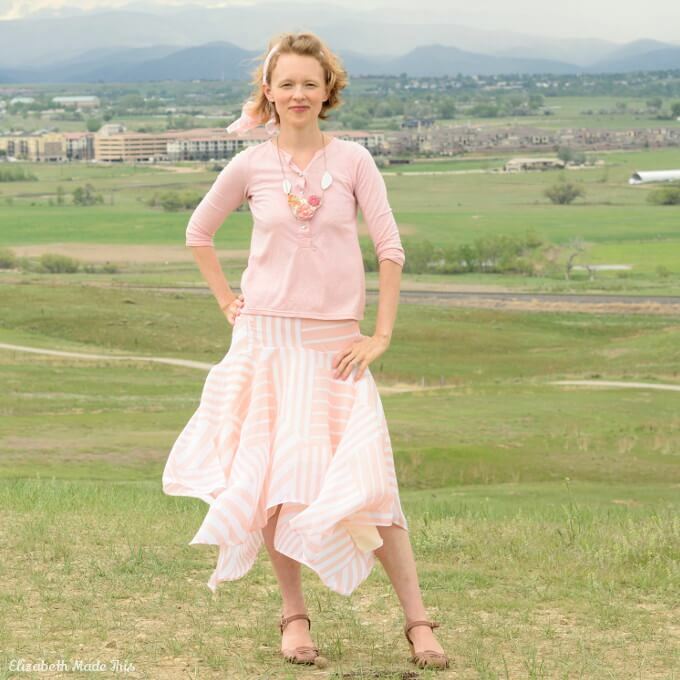 The soft pink tones are so beautiful and the stripe pattern in the fabric works very well with the skirt pattern. Great make! Thank you Sonja! I was unsure about all the seaming in the skirt with the crazy stripe pattern, but I’m glad I went for it! This skirt is Lovely Elizabeth! Thanks Judith! It’s become a favorite this summer! This skirt is everything YES!!!! So dreamy! I am also loving your new background – beautiful scenery! Thanks Rachel! I LOOOVE it! The photos are something new. I’ve gone through this long time of being bummed that I don’t live anywhere where I can get fun “urban” shots, but then on a walk with my family, it dawned on me…um, I live by mountains. People like vacation here! LOL! Thank you so much! It’s becoming a favorite! Thank you Mary! It’s a favorite!